The global bariatric surgical devices market is anticipated to experience high competition among the players, observes Transparency Market Research. Leading players in the market are using different business development strategies to establish themselves in the market and to expand their reach in the global market. Moreover, these players are also putting efforts in research and development activities and are focusing on using advanced technologies to develop advanced surgical devices. On the other hand, small players in the market are using strategies like acquisition to expand their presence in the global market. TransEnterix Inc., Cousin Biotech, EnteroMedics Inc., Agency for Medical Innovations, Medtronics Plc, Aspire Bariatrics Inc., and Intutive Surgical Inc. are some of the leading players operating in the bariatric surgical devices market. 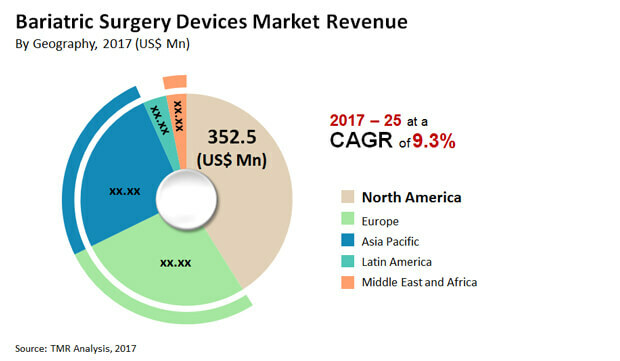 According to the report published by Transparency Market Research, the global bariatric surgical devices market is projected to rise at a healthy 9.3% CAGR during the forecast period from 2017 to 2025. By rising at this rate, the valuation of the market is expected to touch US$1.74 bn by the end of 2025. In 2016, the valuation of the market was US$0.79 bn. Among the various end-users, the demand from bariatric surgery clinics was high as compared to other in 2016. This was due to increasing demand for minimally invasive surgeries that were usually performed in bariatric surgery clinics. Based on geography, North America is leading the global market due to the rising incidences of obesity and associated comorbidities such as sleep apnea, diabetes in the region. Thus to address these diseases the demand for bariatric surgical devices has grown largely. One of the major factors driving the demand in the bariatric surgical devices market is increasing sedentary lifestyle and growing prevalence of obesity mainly in the developed regions. Nowadays, prevalence of obesity is high in developing nations that have increased health concerns at the global level. The rising demand for minimally invasive procedures has also benefitted the growth in this market. Furthermore, government initiatives to spread awareness about the unhealthy food and drinks are likely to boost the demand in the bariatric surgical devices market. Sponsored bariatric surgeries by the regional governments in developed countries and increasing reimbursement coverage are expected to surge the demand in this market. On the contrary, the bariatric surgeries are expensive that could restrain the market from growing at its full potential. Moreover, small group of people having high disposable income and lack of awareness about these devices and surgeries are expected obstruct the growth of this market. However, players in the market are making conscious efforts and investing in research that is likely to benefit the market’s growth. Growing innovation in medical field and increasing study of co-morbidity by the players is projected to reduce the effects of the above-mentioned limitations. Thus, growing efforts by players will increase growth opportunities in the market.